Since I’m smack dab in the middle of true confessions, I also have to admit that there are some crafty projects that have utterly failed. Oh, I love executing a good party – the planning, the preparation, the creative ideas that just pop into my head, the baking, the steaming of tablecloths – well, not so much the steaming. But crafty! Who, me? Sometimes, not so much! 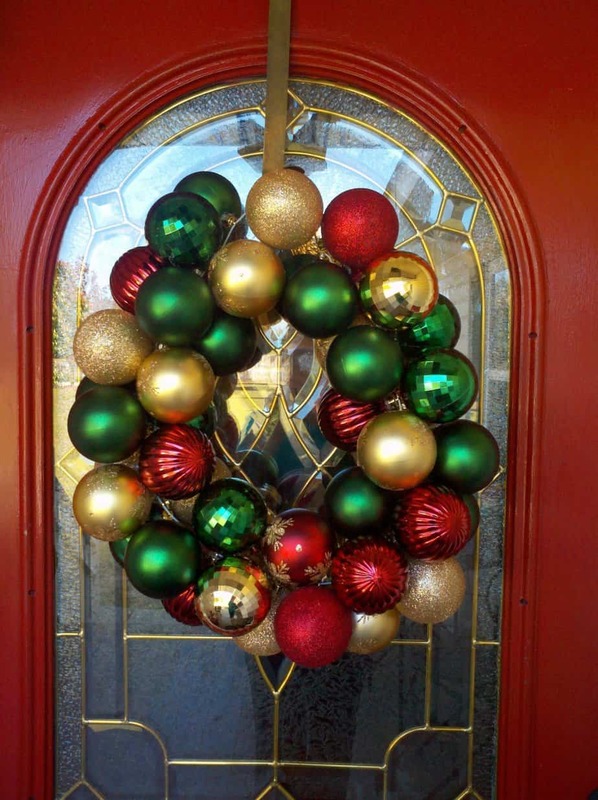 Take the ornament wreath – one wire clothes hanger (like the ones from the cleaners) and a gazillion plastic Christmas ornaments. How difficult could that be? Well, aside from having to hot glue the little cap doodad in place so it wouldn’t fall off the ornament, I could never get the hanger to stay in the shape of a circle. I actually took step-by-step pics to post here. But all I got was a hot mess, a hot glue-gun mess. And, it was whop-sided (southern colloquialism for lop-sided). After all that hard work! See how “whop-sided” it is? And, no, it’s not on my front door. It has been deconstructed! I didn’t bother with the ribbon. I just said no to the ornament wreath. If at first you don’t succeed . . . 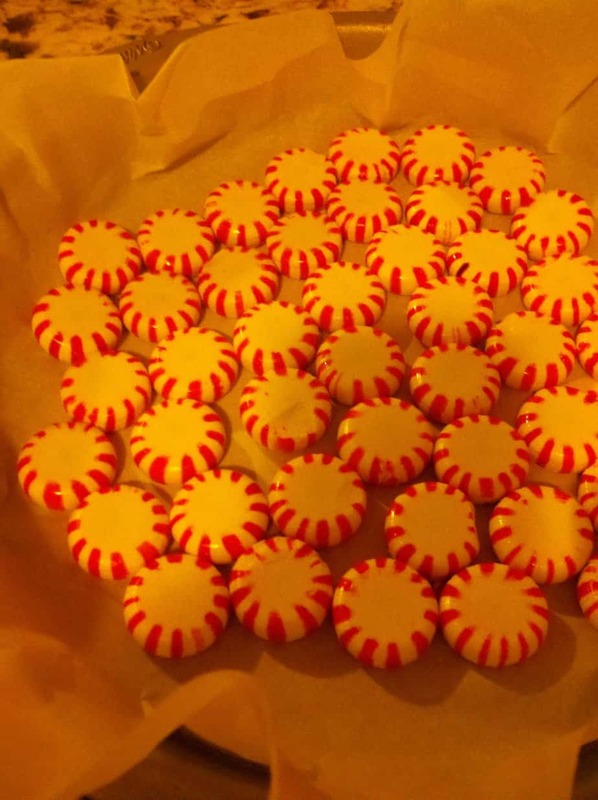 I decided to bite the bullet and make a peppermint candy serving tray. Oh, sweet victory! Here it is. Before baking – should have trimmed the parchment paper to fit the bottom. Oh, well, it came out just fine. Preheat oven to 350. 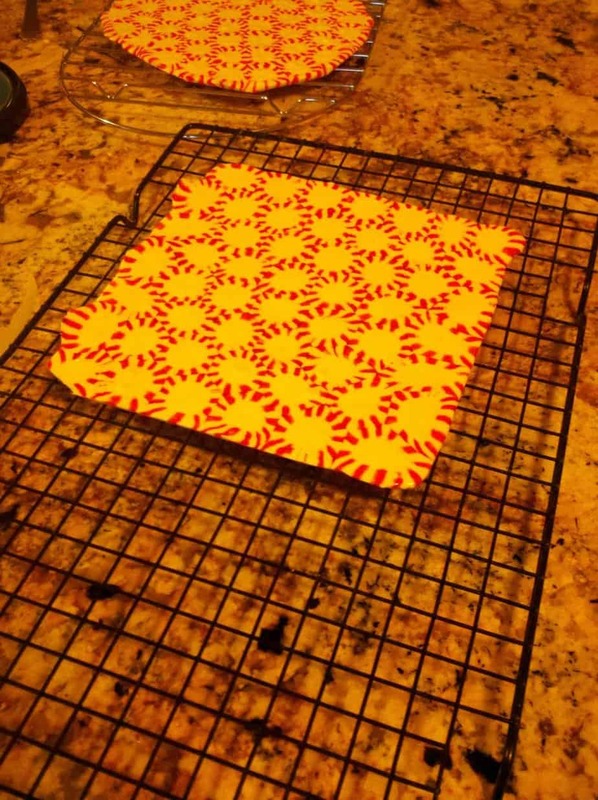 Line the bottom of a cake pan with parchment paper. 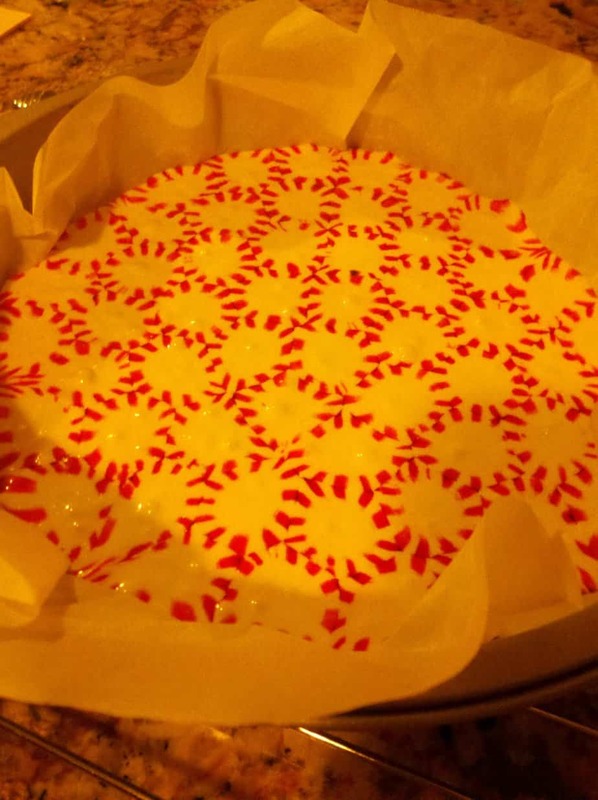 Place peppermints in a single layer, covering the pan. Place in the oven and bake for 10 minutes. Let cool in pan, on a wire rack, for a few minutes. Remove from pan and place on rack to cool completely. I was so excited that it actually turned out right, so I made a square one. I had to leave the square one in the oven a few extra minutes because the candies had not melted together. And if I had a Christmas Tree shaped pan I would have tried that. I’m thinking about doing a large tray. I’ll let you know how it works out. Oh, the possibilities! This is an awesome way to serve treats at a Christmas party. I’m going to try and make one with sides. I’ll keep you posted! P.S. – Make sure you don’t miss A Few of my Favorite Things . . . Girlfriends Unlimited Event. It’s next Thursday and I will be posting pics, recipes, etc. a few days afterwards. Also, in case you didn’t hear, the Gingerbread House/Train Decorating Party was featured as the party of the day at Catch my Party. I was so honored! And I got the sweetest email from the owner of that site. I’m so blessed! Disclaimer: These pics were taken with my camera phone and I did not know they were on the wrong setting. My photographer daughter (never around when I need her) informed me that these pics were too yellow. I didn’t know my camera phone had different settings. I have never claimed to be techie. Future photos via my phone should be markedly improved!